While Valentine’s Day is a time to proclaim your feelings for your one true love, let’s not forget another important aspect of the day – chocolate. Whether it’s cream-filled delights or a sampler box, Feb. 14 is a chocolate lovers’ dream. Did you know that dark chocolate can actually be good for you? A 1½-ounce square of dark chocolate can provide powerful antioxidants through the flavanols found in the chocolate. Studies have shown dark cocoa powder is a terrific antioxidant, too, and can help reduce high blood pressure, and possibly lower your risk of a heart attack. Cocoa powder can be used in a variety of ways. A chocolate banana smoothie is a great way to start your day because it gives you anti-inflammatory benefits and a good dose of potassium. Simply mix 1 cup vanilla yogurt, a frozen banana, and 1½ tablespoons of cocoa in a blender. Drizzle a little honey over the mixture and process until smooth. If you need to thin it out, add milk. 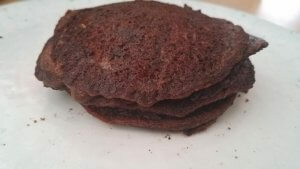 Chocolate pancakes also can be made using cocoa – just add two tablespoons of cocoa powder into your regular pancake batter, mix well, and enjoy! If you’re a true chocolate lover, you can amp up the chocolate flavor by adding a couple teaspoons of brewed coffee to the batter. The same can be done with waffle batter. Dark chocolate, when eaten in moderation, can help raise your HDL (good cholesterol), provide powerful antioxidants, and possibly lower your risk of heart disease by improving blood flow. For instance, add a half to one cup of dark chocolate chips to your favorite muffin recipe. 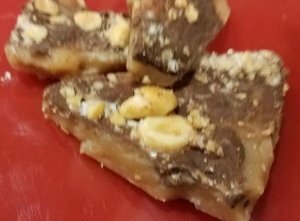 They also are delectable when added to toffee. Chocolate chips are a great contrast to salty snacks, so add a handful to room-temperature popcorn, trail mix, or even your morning bowl of oatmeal. Melted dark chocolate chips make a great coating for pretzels, potato chips, even whole nuts such as almonds, which have their own health benefits, or pecans. Simply place dark chocolate chips in a microwave-safe bowl and heat for 30 seconds intervals, stirring after each. Combine leftover melted chocolate with marshmallow cream for a fantastic dip for apple or banana slices, graham crackers or cookies. You don’t have to be a great cook to make treats that will score big brownie points with your significant other. Enjoy spending time with your sweetheart and the delectable goodies you create that are actually good for you. Happy cooking, everyone! In a large bowl, whisk together the pancake mix, salt and cocoa. Mix in the egg and oil, then add the coffee and water/milk last. Whisk until no lumps remain. In a skillet over medium-high heat, drizzle a little oil, and let heat thoroughly. Drop some batter into the pan to test the heat. When the pan is hot, pour approximately 1/3 cup batter onto pan. Turn the pancakes when bubbles begin to form in the middle, flipping only once. Melt butter in a medium saucepan, then add sugar, water and syrup. Insert candy thermometer and cook to 300°, stirring frequently. Mixture will rise, then fall. Immediately spread onto jellyroll pan, then let cool 4 minutes. Sprinkle chocolate chips all across the top, and let stand an additional 3 minutes. Sprinkle nuts on top of chocolate and press down slightly. Let harden, then break into pieces. NOTE: Any flavor of chocolate chip can be used with this recipe and white chocolate chips are great if you’re avoiding caffeine.